Originally from Houston, Texas, DRIVE was formed by guitarist and songwriter Rick Chavez who led the band with his extraordinary guitar technique and amazing ability to tell stories with his songs. Other members include - the dynamic vocals of David Earl Taylor, guitarists Mercy Valdez and later Mike Conde, (when Valdez left the band for personal reasons,) bassist Michael Anthony Guerrero and drummer Valentin San Miguel. Included on some of these rare tracks are the talents of bass player Michael E. Ribeiro and drummer Carlos Cervantes. IDEFI is 13 unreleased songs that include both Taylor and Chavez taking the lead on vocals. The band’s signature style is intact with a sound that brims with pride and an unrelenting fighting spirit. Although these songs were recorded over 25 years ago, the thought-provoking lyrics still resonate today with a musical backdrop that roars with power and precision. 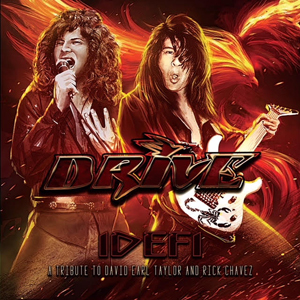 The album features a 24-page booklet, liner notes from Chris Leibundgut, heartfelt tributes to both Chavez and Taylor from their bandmates and members of the DRIVE family. The first 100 CD’s ordered will also include a Rick Chavez guitar pic/plec replica. This album is limited to 500 physical copies and available at: vanitymusicgroup.com/store, and digitally at www.DriveHTX.com. On June 30, 2009 lead vocalist David Taylor passed away after a fatal car accident on a San Antonio Interstate. Upon hearing of Taylor’s passing, 20th Century Music label heads Kai Brockschmidt and Dave Tedder reached out to Chavez via Facebook to offer condolences and a virtual relationship began. Brockschmidt had first become a fan of the band when he grabbed a vinyl copy of Characters In Time in 1988. They asked Chavez if there were any unreleased songs, but devastated by the loss of his brother and singer, Chavez wasn’t ready to talk music. Some time went by and Chavez decided it was time to release the songs as a tribute to the life and legacy of David Earl Taylor. During the production of the IDEFI album, Rick Chavez unexpectedly passed-away from an internal bleed that was undetected until it was too late. Joining his singer and friend on the other side, the album is now a tribute to them both. DRIVE originally came together when its members were barely out of high school and the band moved to Los Angeles, which was quickly becoming the epicenter of the current rock scene. Winning a radio contest with their song “I Need The Nights”, DRIVE landed on KNAC radio’s Best Of The West compilation that was released on Rampage Records. Soon after that release, Rampage signed the band, and in July of 1988, released their debut, Characters In Time. The album received tremendous reviews from the industry’s top rock press, including the coveted 5 “K” rating from Kerrang! Magazine. Characters In Time was followed by their 1992 album, the sonically advanced Diablero on Zoo Records. Chavez continued to write and record, but the songs were never released, until now.